Summary: At this year's conference, students can get involved in a fun, new way! Get the behind the scenes exclusion of a conference! Students will get to directly see how sessions are synthesized, organized, and structured. This program will also give you a chance to interact with key researchers in your field. Shadowing a Session Chair: Students will be paired with a Session Chair, where you will learn how to run a session. After arriving early to the session you've signed up for and introducing yourself to the Session Chair, you will have the opportunity to observe how the Chair is coordinating the session up close. Afterwards, depending on the session chair's schedule, you should have the opportunity to ask questions relating to the session such as ie. questions brought up in session, setup. Students who are interested should first find out who they would like to work with, by reading the session guide and selecting a chair that they would like to be their mentor. Please email the name of the session, the date, and your relevant contact information to this address. Keep in mind that occasionally people are busy, so you may also wish to provide an alternative mentor name. The student activities committee would like to thank EMBS for input into designing this program. The Organization Committee has required the help of students for organizing the conference. You will work for one day (basically posting session programm and running errands for the organization) and you will get a free IROS tee-shirt, full access for the remaining of the conference, including the banquet. Evidently we cannot accomodate trip and local accomodation expenses. If you are interested please contact the Conference Secretariat. Activities in this section are provided under the responsibility of their organizers. students interested in activities in Nice after the Conference hours may contact the "Last session chair" Geraldo Silveira . If you've got facebook, we've got two groups for you. 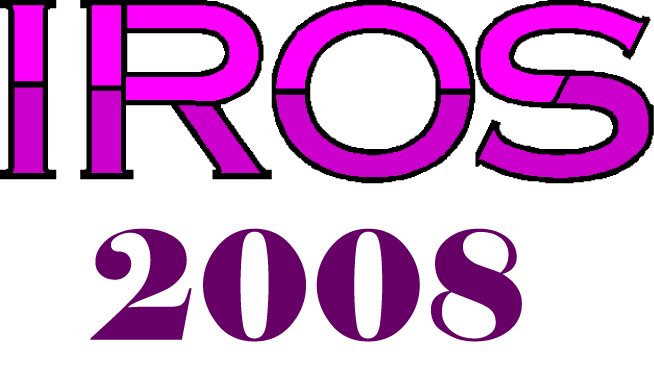 Add the IEEE IROS 2008 event and connect with other roboticists going to this conference!